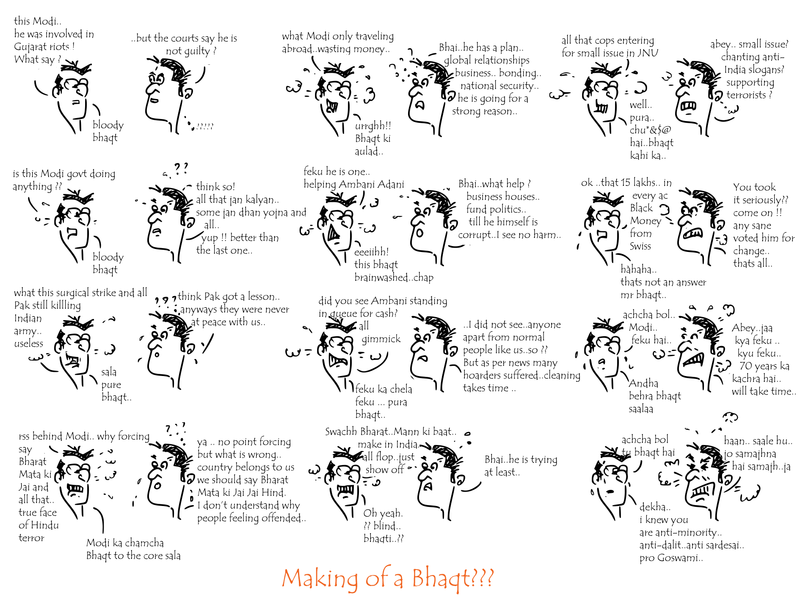 Sickular Vs Bhaqt | Making Of Bhaqt ? Since the invasion of Modi on Delhi as the PM the nation seems to be divided into two major clans : Bhaqts and Sickulars. And looks like nobody likes you to stay anywhere between. Be it the Sickulars aka the anti-Modi clan or the Bhaqts aka the pro-Modi clan, none allows you to stay in this political “no clan’s land”. The sickulars, as the bhaqts have named them, have suddenly started feeling that India needs yet another freedom fight and yet another Gandhi ( reincarnated as Mr Sniff Kejriwal or the new “Red” boy Kanhaiya. Some see Gandhi in Rahul as well). On the other side, the bhaqts, as the sickulars have named them, feel the Messiah of Bharat, has finally made it to the throne and that now India will become super power in another 3 years or so. Well!! Everyone has the rights to chose a hero or two. We Indians are no less. We need superheroes as much the entire world needs. So be it !! Choose Modi or Kanhaiya or Kejriwal or even MSG or Salman. Who cares ?? With the Modi govt taking some strange and rarely taken “strikes” before and their debatable outcomes (short term, you may argue ), the sickulars are getting the breather zone. And being sickular would mean you cannot even doubt about the philosophy that Modi is Hitler. That Modi is killing democracy. He is anti-minority and for sure anti-muslim. He lies about everything. He is the second name to destruction. Muslims and other minorities are being harassed for being so. And yes, the nation has been captured by him and his army of Bhaqts, Senas, Dals and RSS. Also, the note-ban was some moronic step for no reason and/or to help Amabani and Adani wash their black money to white. Surgical strikes on Pakistani land was a self made story by the Messiah and his men. As much one blames Arnab Goswami of talking pro-nation and BJP only should he/she also not blame Barkha Dutt and likes for show-casing Kanhaiya Kumar as a hero and Hardik Patel as rebel ? 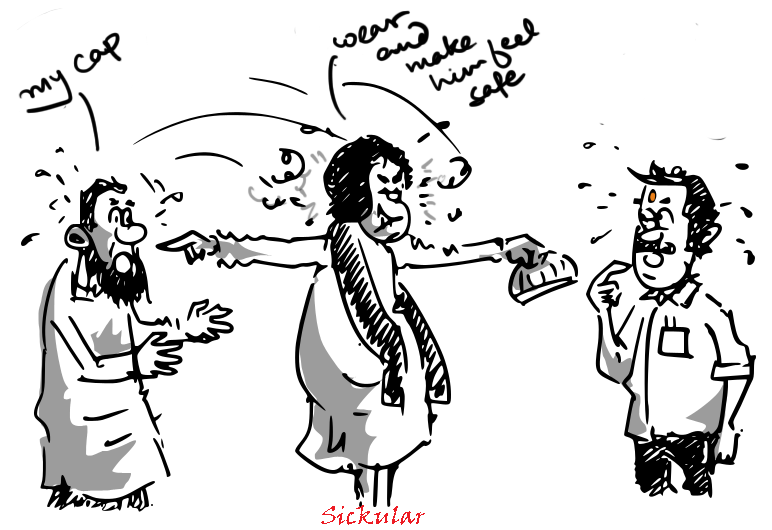 The Bhaqts and Sickulars. Please play your clash of clans amongst yourselves and let monkeys eat bananas and dogs bark at strangers. Let some be themselves. Click here to enlarge image! Get toons in your email! !